I have been card making for about 8 years. The card fold is a step card. 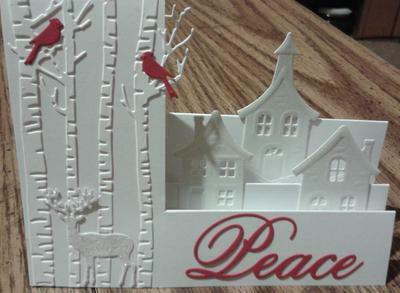 Except for the sentiment, this card is completely made from die cuts. Birch Trees (Cardinals are part of this set). I believe this is from Impression Obsession. Deer - Impression Obsession #DIE117-C, cut from glitter paper. Peace - Impression Obsession, cut from red or glitter paper. Houses - Lea'bilities #45.9012, I got this set from Amazon. Cut from shimmer paper. I used the cloud border from this set to make snow banks, which I put in front of the houses and some on the front of the card, cut from glitter paper. Labels 25 - Spellbinders Shapeabilities #S5-077, I used this on the back of the card for the sentiment and on some for the peace die cut. I made 3 different designs, in white and red and in black and red. I received a lot of compliments on these cards and I have to admit they were beautiful. I am not surprised that the compliments flowed as these cards are so pretty and would be sure to please the recipients. This idea could be adapted to suit any occasion and they are truly a credit to you. Your cards are lovely and so different. I LOVE all of your designs. Please keep sharing your inspirational work. 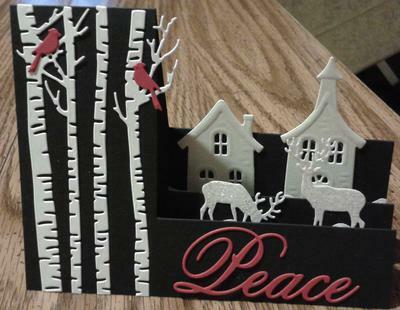 Hi Melanie, these die cut Christmas cards are beautiful! Although it's only May, it makes me want to start some Christmas cards right now. I have either exactly these dies or something very similar so I may well give them a try. Thanks for the inspiration. Thank you so much. I received many compliments from people that I sent them to. I don't know that I will ever be able to top them, but I will have fun trying. Thank you! I thoroughly enjoyed making them.